In Sturbridge, Massachusetts, there is a place called the Old Sturbridge Village which is a living museum. Norm seen an old kitchen cupboard with simple designs but very functional. Even the cut outs of the side panels are re-used for shelving. 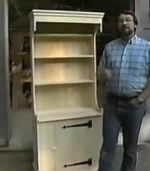 Simple store bought moldings, stepped together, can make up the design or you could make your own if you have a router table.